I posted not one, but TWO different pizza crust recipes on here last year. Since then, I’ve made a lot more pizza than I’d like to admit but didn’t use the same crust recipe each time. While the ones I posted were delicious, I started looking for something else. All of a sudden, I had new criteria for the pizza dough I was looking for. As a New Yorker, I’d like to think I know what good pizza (and crust) should look and taste like. I’m not a professional pizza person but I know what I like. 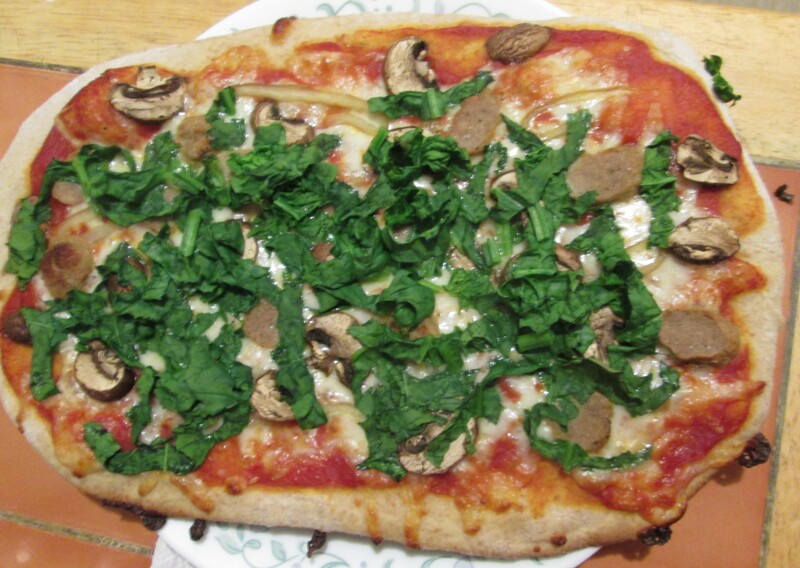 For me, the key to great pizza crust is to have one that’s sturdy, slightly chewy, super thin, toasty and crunchy. Sounds complicated but is actually somewhat easy. First thing’s first, let’s talk ingredients. The main difference between this recipe and the one I posted previously is the flour. What’s the big deal here? Well for one, this recipe uses bread flour! I started using bread flour just recently and have completely blown my own mind, which is ridiculous considering I bake bread weekly and have never used it. It’s crazy but I’m like, bread flour 4 lyfe now. The thing about bread flour, that isn’t the same as all-purpose, is that there is more protein in there. More protein = more gluten. The more gluten in your dough, the chewier it becomes. Magical, right? Obviously we want a chewy crust, so bread flour was a little bit of a no brainer. The second difference between both recipes is the yeast. For this recipe, I used instant yeast. Now, there’s not much of a difference between instant and active dry yeast because they both do the exact same thing. However, one is a lot easier to use than the other. For starters, with instant yeast, there’s no need to proof it in warm water before incorporating into all the other ingredients. The yeast can be combined with the dry ingredients with zero issues. That means I don’t have to worry about killing the yeast before I even start the recipe by using water that’s too hot. The second best thing about instant yeast? You can skip the first rise! Man, I love this part so much! Instead of having your dough proof for an hour after kneading, cover that bad boy for just 10 whole minutes before moving on to part two. Isn’t that great? This means I can get to bread, or pizza in this case, a lot faster than before. One final note about instant yeast is that if you’re subbing it for active dry, the amounts do not change. An envelope of active dry yeast contains 2 1/4 teaspoons of yeast, which means that if I were to use instant, I’d use 2 1/4 teaspoons as well. Now that we have our ingredients down, let’s talk dough for a second. I make all my doughs by hand. It’s good to get into kneading and making your own dough before letting a machine do it, so you know when your dough is ready. Considering I don’t have a mixer yet (insert tears here), I know my doughs quite well. When kneading, you need to keep on going until it’s no longer sticky, and is smooth and elasticky (is that a word?). It sounds weird but the more you get to know your dough, the easier it is to figure out when you’re done kneading. It’s also helpful to knead as quickly as possible. The faster you move your dough around, the faster it’ll come together and minimize your kneading time. If you’re doing it by hand, this is especially important. 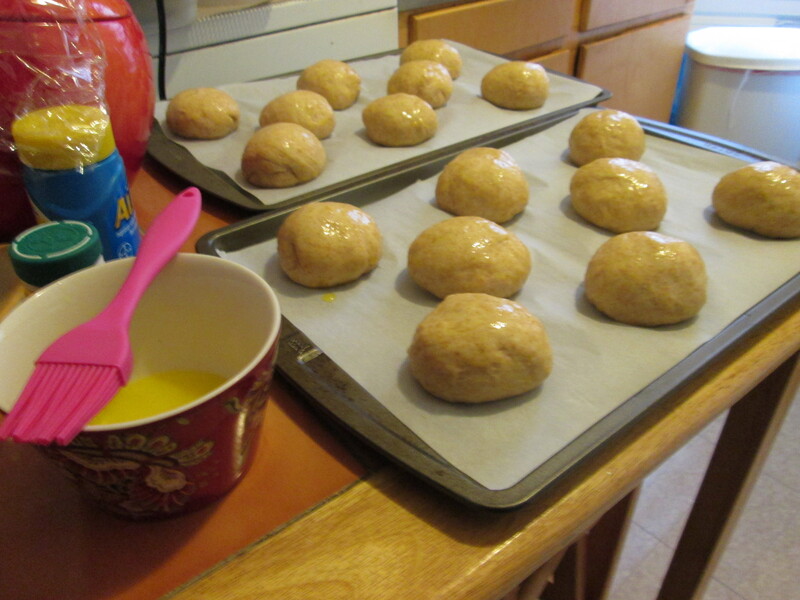 Since we skipped the first rise, thanks to instant yeast, make sure your oven is hot before you get started. A hot oven is crucial when making the ideal pizza crust. If you have a pizza or baking stone (you lucky duck), this is the best time to use it. It helps get that crispy and toasty thing I mentioned, and it also looks cool in your oven. I don’t have one, so a baking sheet works just fine. Line that sheet with some parchment paper before putting the dough on it. I think you can skip this step for most sheets (maybe a drizzle of olive oil for security) but I like having it on there. Once that’s ready, roll out the dough. There’s two ways to go about this; you can use a rolling pin or stretch it out by hand. I won’t judge you if you use a rolling pin (I’ve done it before) but I prefer stretching it out by hand; makes me feel like a legit pizza maker. You don’t have to do any air tricks or anything, just make sure you’re stretching it out uniformly. Once it’s stretched and shaped to your liking, sauce and top that beautiful hunk of unbaked crust. Go crazy with your toppings! We kept it pretty clean and simple but use what you like. I’m a fan of throwing greens on my pizza for two reasons: makes me feel like my pizza is ~healthier~ and because I won’t eat them otherwise. I’m terrible like that. 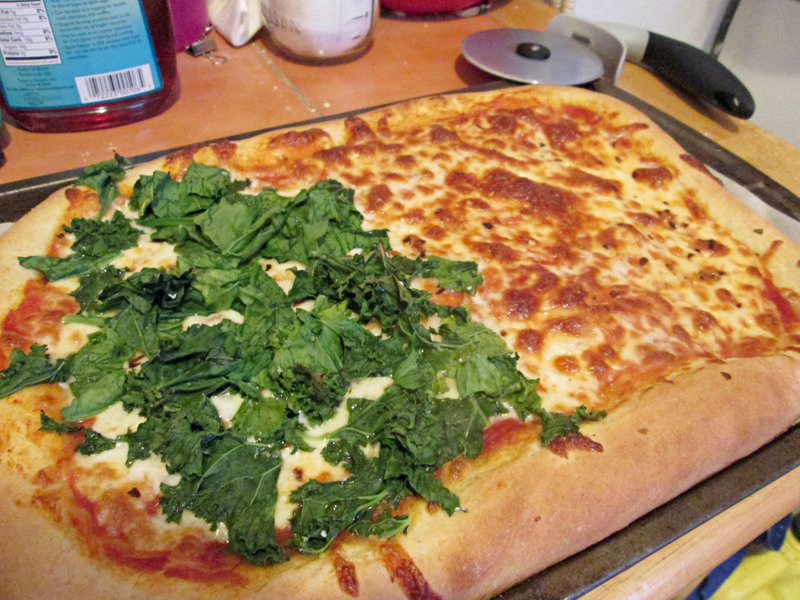 When I do add greens, I top my pizza with them during the last five minutes of baking so they won’t burn or dry out too much. Does this crust match my criteria? Yes it does! It was definitely sturdy; it held all that cheese and those greens beautifully. It was slightly chewy, thanks to that bread flour. Most parts were thin, crispy and crunchy just like I like, and was ultimately delicious! The crust parts got away from me and got a little too thick but no worries there. It’s subtle in taste as well, which is great if you’re using toppings that should be singing on their own. Since we kept it plain, my pizza tasted like the pizza I was looking for. Since converting to bread flour and the magical instant yeast, this recipe a keeper! Preheat the oven to 450F. Line or grease a sheet pan and set aside. Alternatively, ready your baking stone if you’ve got it. In a large bowl, combine the flour, yeast, sugar and salt. Add the warm water and olive oil, and mix until combined. Turn the dough out onto a lightly floured surface and knead until smooth, up to 10 minutes. Cover the dough either with a towel or the bowl and rest for 5-10 minutes. Gently deflate the dough and roll/stretch out into your desired shape. Transfer the dough to your prepped pan and top as desired. 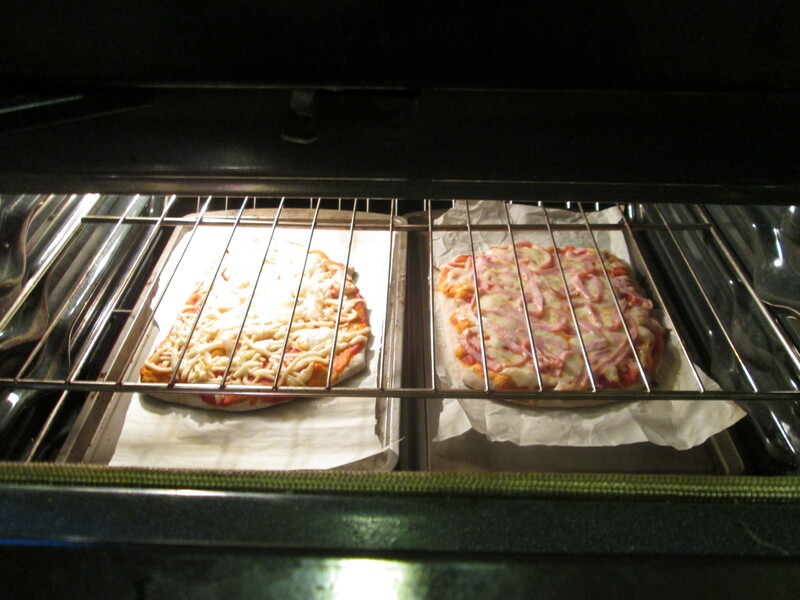 Bake pizza for 15-20 minutes, or until crust is golden brown and toppings are cooked. Cool for five minutes before serving. If you don’t want to use parchment or oil, lightly dust your pan or stone with cornmeal. Another great thing about this recipe is that it uses less flour. Yay! I have no idea where or when I ate my first falafel but I do know that it was love at first bite. I think it was my sister who introduced me to the magic that is that tiny ball of crunchy and fluffy chickpeas. Since then, I’ve been OBSESSED. I try to get my falafel fix wherever I can get it; most commonly at the Whole Foods hot bar. I know, it’s not exactly ‘legit’ but it fills the void. After trying it for the first time, I’d been dying to try and recreate that magic at home. Now, I’m not one to experiment much in the kitchen with savory items. I personally like the comfort of established recipes but I really wanted to put my own spin on this. 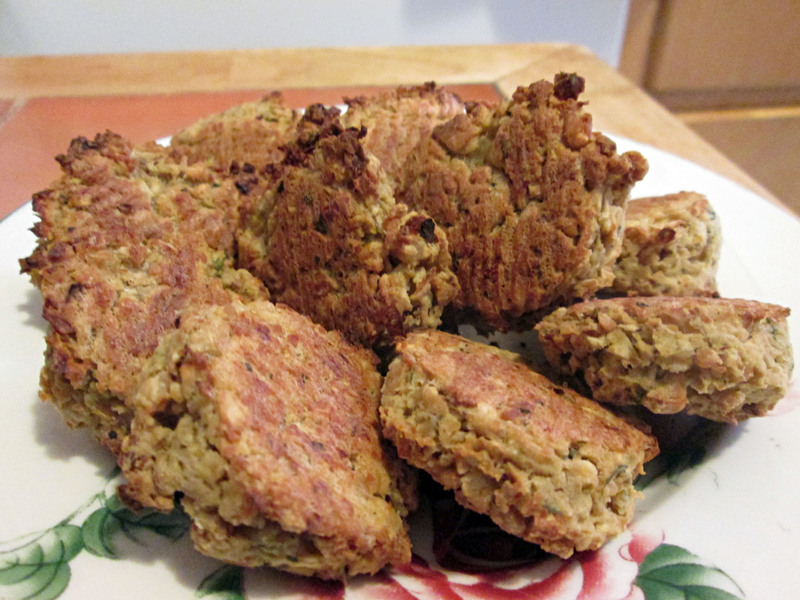 Most falafel recipes have common ingredients, so I cross referenced with what I had and didn’t and got to work. This recipe was the result of three (four?) different tries. The first ones were way too smooth and soaked up a ton of oil but the flavor was there (and I also forgot to write down what I did). The second ones were on point texturally but were lacking in flavor. I repeated what I did the second time and tried to amp up the flavors, which resulted in salty fritters. At this point, I had been eating chickpeas several times for three weeks straight. I wanted to try one more time, tasting as I went along, and got something I was happy with. My fritters are pretty different from traditional falafel. For starters, these are baked. The first three tries, I pan fried them in some oil. They came out all nice and crunchy but they soaked up all that oil, which was kind of a turn off. 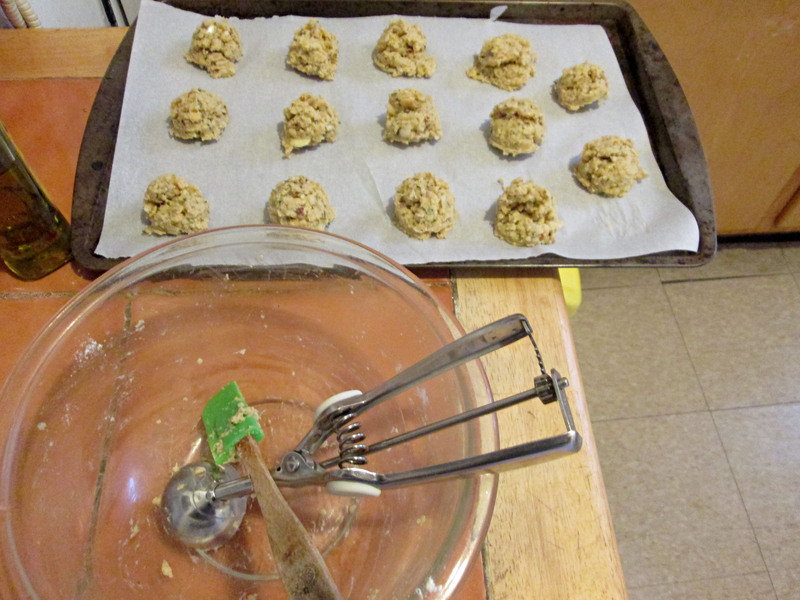 Instead, I brushed them with a little bit of oil before baking and added a couple teaspoons to the chickpea mix. Mom’s Sofrito/sazón. Can you guess what’s in here? Another big difference is in the ingredients. 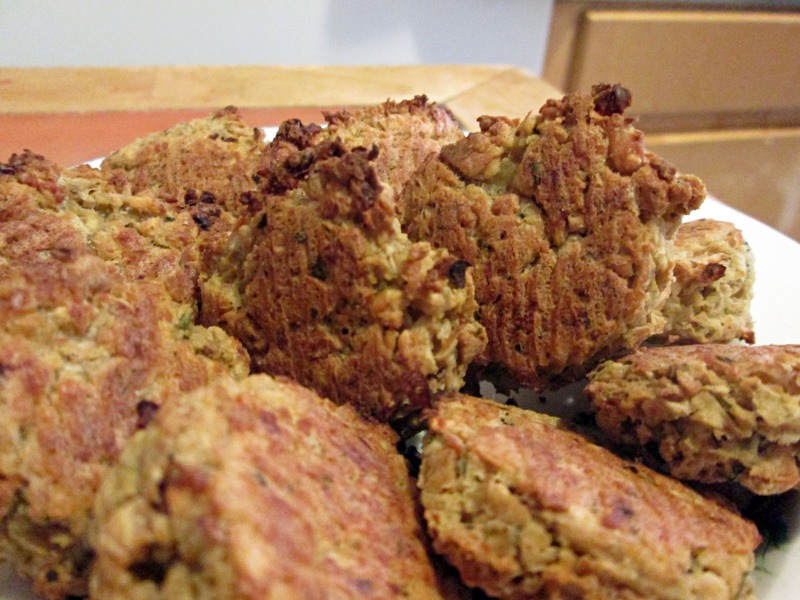 Traditional falafel recipes use tons of fresh herbs and other spices, most of which aren’t used in my house. The issue here is that if I buy them, they’d go bad. I’m not one to waste food, so I looked for another way to give my fritters flavor, even if it meant sacrificing authenticity. Enter my mom’s secret ingredient. Go into any Dominican woman’s household and there is a chance that somewhere in her kitchen, she’s hiding her signature flavor bomb. I’m talking about sofrito. 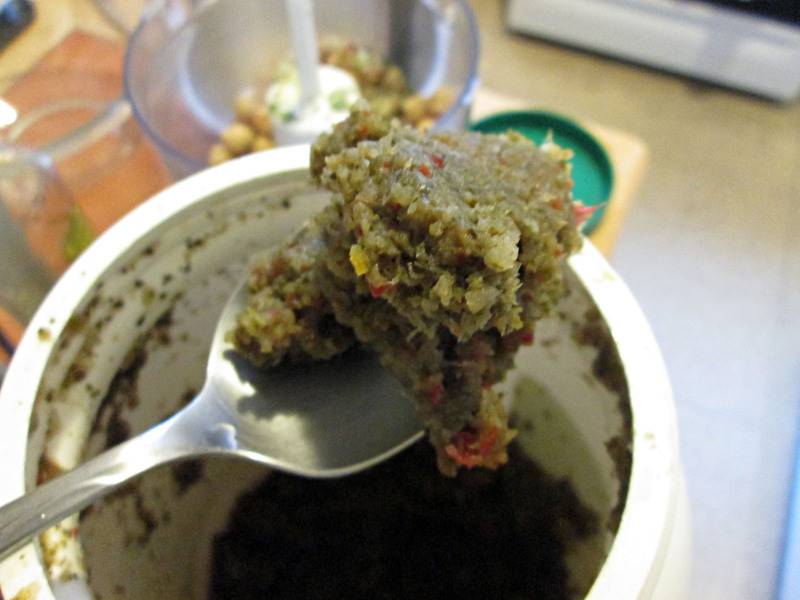 Sofrito is basically a blended mixture of a bunch of seasoning ingredients. Common ingredients in this stuff ranges from a variety of peppers, onions, garlic, tons of cilantro; among other things. I’m not exactly sure what’s in my mom’s sazón or else I’d tell you, but I plan on getting that recipe…. eventually. For now, I just stole a couple tablespoons. Along with my mom’s Dominican sazón, I also threw in some of her other essential ingredient; Adobo all purpose seasoning. With this, please be careful. This stuff is salty if you put in too much, so watch your salt amounts when using this stuff. This is probably why my third try came out too salty. And finally, I added some dried parsley. The result? 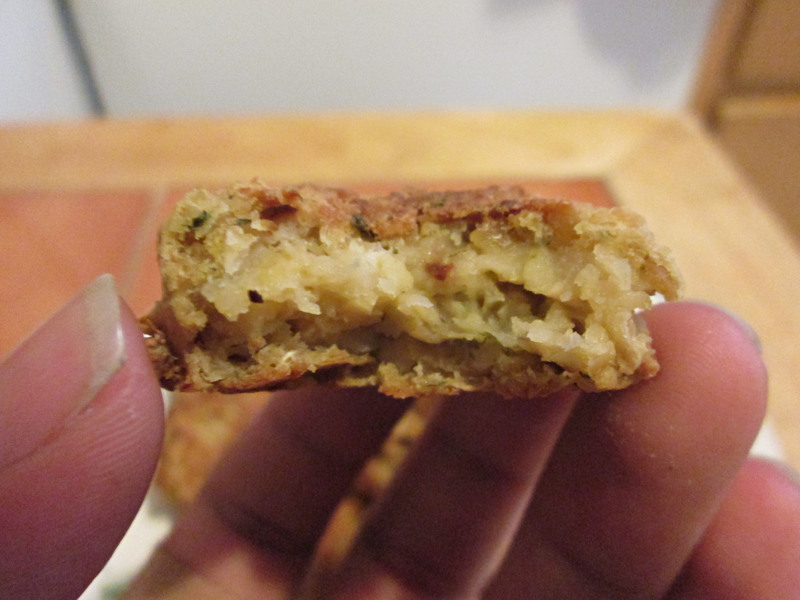 A surprisingly crunchy but creamy and chunky little fritter! I was very happy with these results. They were flavorful, spicy, and totally not greasy. Sure, they weren’t ‘legit’ falafel but at least with this recipe, I can get my fill of chickpeas in the comfort of my own home. They are far from perfect but for my first time creating a recipe, I’d say I did pretty well. Preheat the oven to 400 degrees, and line a baking sheet with parchment paper. 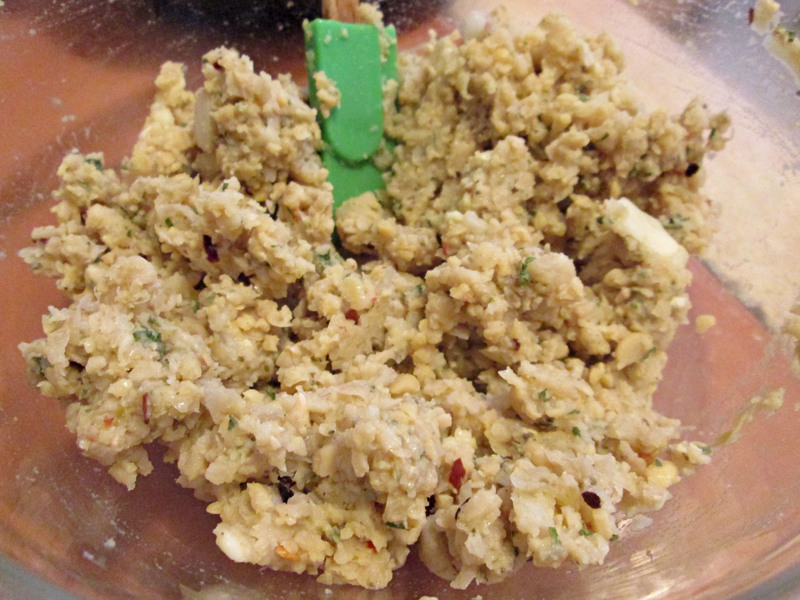 In the bowl of your food processor, add the chopped onion and garlic cloves. Add the chickpeas, along with the red pepper flakes, Adobo, sofrito, oil, dried parsley, and a pinch of salt. Pulse until the mixture is chunky but combined. Empty the contents of your processor into a bowl, giving it a mix with a rubber spatula. 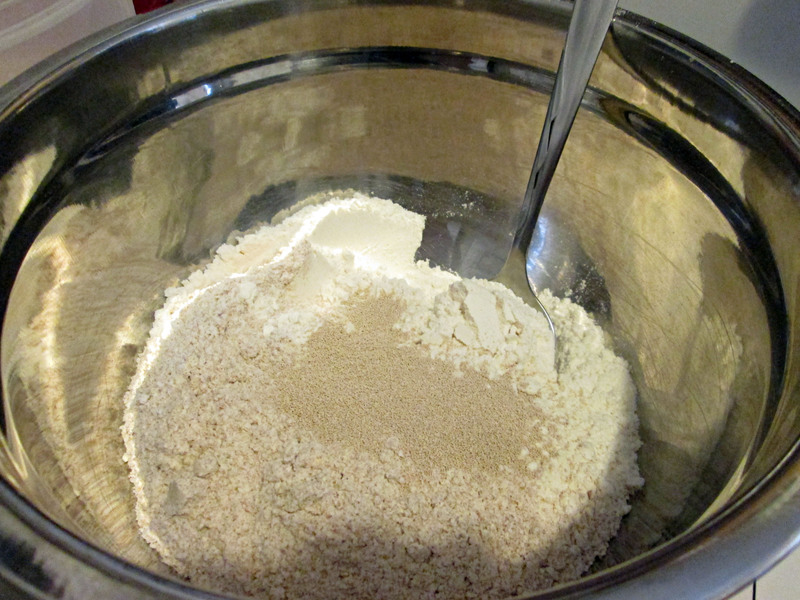 Add the flour by the tablespoon, mixing after each addition. Check to make sure the mixture is not too dry or too wet; it should come together when gently pressed into a ball but it shouldn’t be too sticky. Using a small disher or a tablespoon, portion out the chickpea mix onto the prepped baking sheet. Gently flatten out the balls, and brush with a little bit of olive oil. Bake in the preheated oven for 20 minutes. 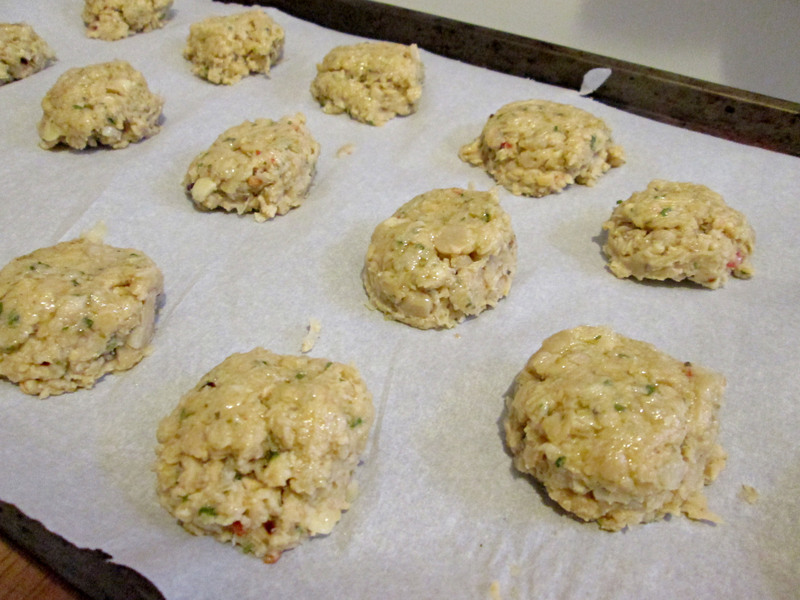 Flip them over and bake for another 10-15 minutes. Cool slightly before serving. I’m assuming the majority of you don’t have access to sofrito/sazón. In lieu of that, please add more onions, cilantro, and some bell peppers to your mix. At least until I can grab that secret and post the recipe! When adding the flour, less is more. 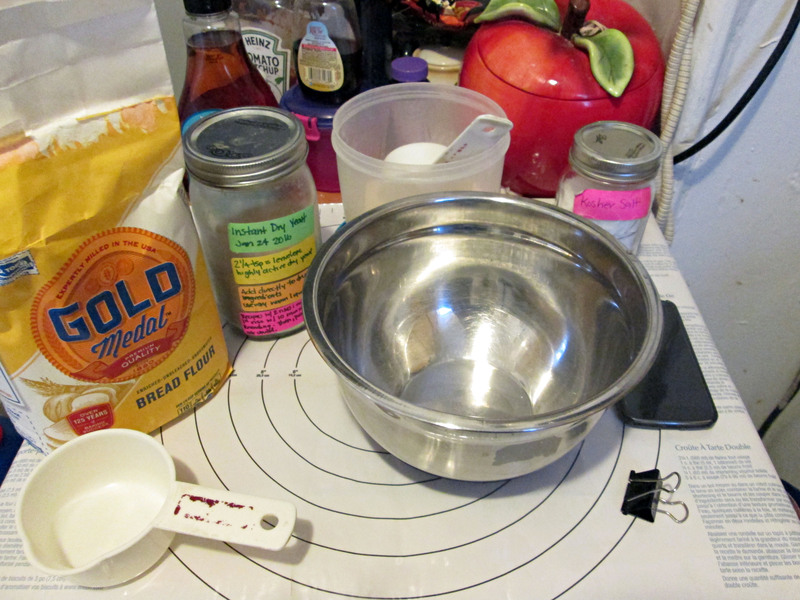 Test the mix after each tablespoon to make sure you’re not adding too much flour. You can find Adobo all purpose seasoning in the ethnic aisle of most supermarkets. You’ll also find something in a jar called “sofrito.” It’s not exactly the same but it’s an okay sub to the one I used here. You can also make the mixture and throw it in the fridge for a while, if needed. It’ll help the flavors develop. Want to fry them? You can pan fry them in some canola oil or take the plunge (ha) and deep fry them. If you’re pan frying, put them on a baking sheet and bake them in the 400 degree oven for 10-15 minutes after frying. Last week’s Polar Vortex inspired me to make something that wasn’t dessert. I have to be honest, I’m not much of a cook. I prefer baking because it’s formulaic, and that gives me reassurance that it’ll work every single time. I mean, it’s science; when has science ever been wrong? Anyway, I don’t like cooking much because it’s basically a free for all in a pot, while crossing your fingers that everything will taste good. I know that there are recipes for savory dishes but I feel like I have a bigger chance to mess up, which makes me nervous. So, this Polar Vortex. It was freezing everywhere last week. In my house, there was a lot of hot and liquid dinners happening. My mom made a giant batch of soup for two reasons; this crazy cold and because my dad is sick. I’m not a fan of soup, so I was on my own. They ate that stuff for the entire week, while I had to figure out dinner myself. I’m not a stranger to making my own dinners, as I have been doing so for quite some time. They’re usually super simple, like a baked potato or a bowl of brown rice (which I still can’t make). The lack of formulas and rules in cooking scares me, which is why I am a baker. Having this blog has pushed me into the kitchen more often, which I love, but there’s more to cooking and baking than sweets (blasphemy!). I trucked into my kitchen, looking for something warm to make. I got sick of eating potatoes and dinosaur shaped chicken nuggets (don’t judge me; they’re delicious), so it was time for a real dinner. I’m kind of a fan of mac and cheese. I say kind of because I’m usually hot and cold about it. I love pasta and I love melted cheese but eating a bowl of mac and cheese can get old really quickly. 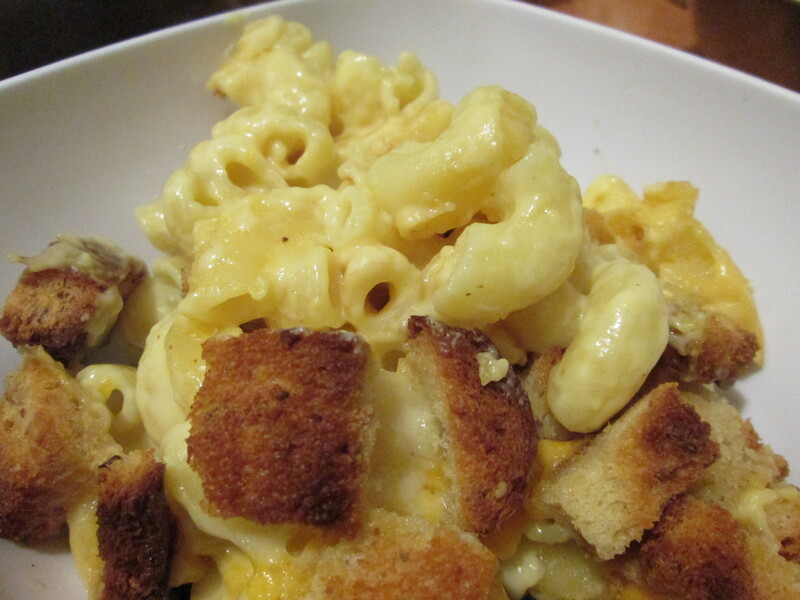 The lack of tastes and textures usually found in mac and cheese is boring to me, which is why I rarely eat it. However, in a moment of freezing weakness, I decided to make up a batch and am really glad I did. This recipe, which I found through Smitten Kitchen (one of my favorite blogs), is actually Martha Stewart’s. If you don’t know, Martha is the queen. She knows her stuff, so I knew this recipe was a good one; a bonus because Deb had made it as well. 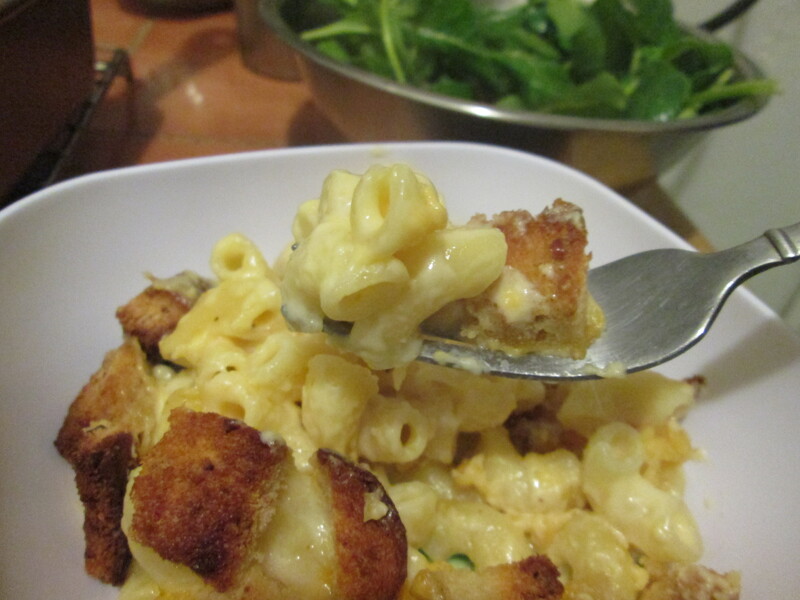 I was intrigued because this recipe seemed to solve my monotonous mac and cheese issue with the homemade crouton topping. I love my carbs with more carbs; the more the merrier! I made half of the original recipe, and followed it pretty much verbatim. The only change was that I used yellow sharp Cheddar instead of white. This mac and cheese was amazing. It was so much better that that boxed stuff (anything is better than that, honestly)! Not only was it delicious but it was so easy to make. I set up a mise-en-place and breezed right through everything. It helped to have an extra set of hands, too. This was also my first foray into making a bechamel sauce, a.k.a one of the mother sauces. I was so nervous about messing it up but it was a lot easier than I thought. The result was a super cheesy and delicious pasta dish. Both of my parents, and even my lactose intolerant sister, loved it! The fact that my dad, Mr. “I hate melted cheese” liked it was enough of an indication that this recipe is a winner. 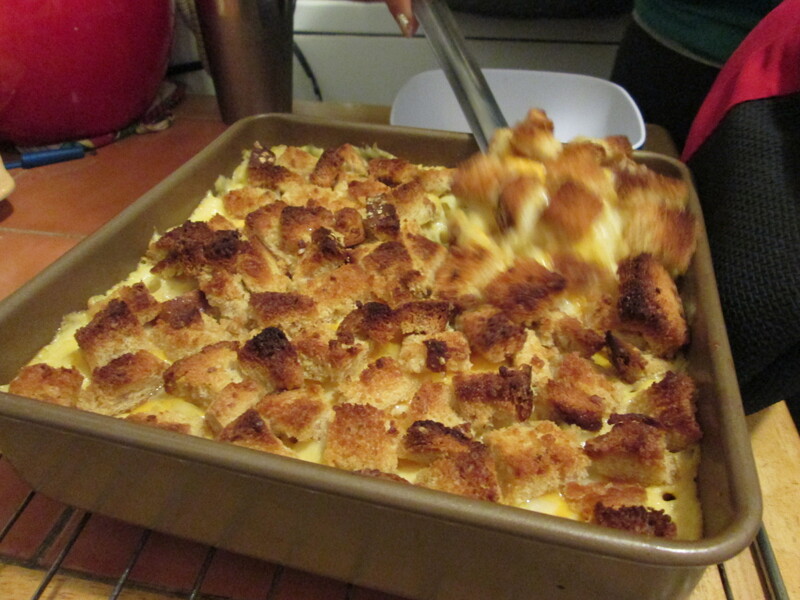 The crispy cubes of bread was a welcomed texture change, in the mix of soft, and gooey elbows full of cheese. Accompanied with a salad, this is the perfect dinner for one of those super chilly nights. The success of this recipe has inspired me to continue getting in the kitchen to make things other than cakes and cookies. I hope to make and post a savory dish at least once a month. It’s important to face your fears, even if you were pushed into it by (freezing) outside factors. Preheat oven to 375F. Butter a 2 quart pan/casserole dish and set aside. Cut bread into cubes and place into a bowl. 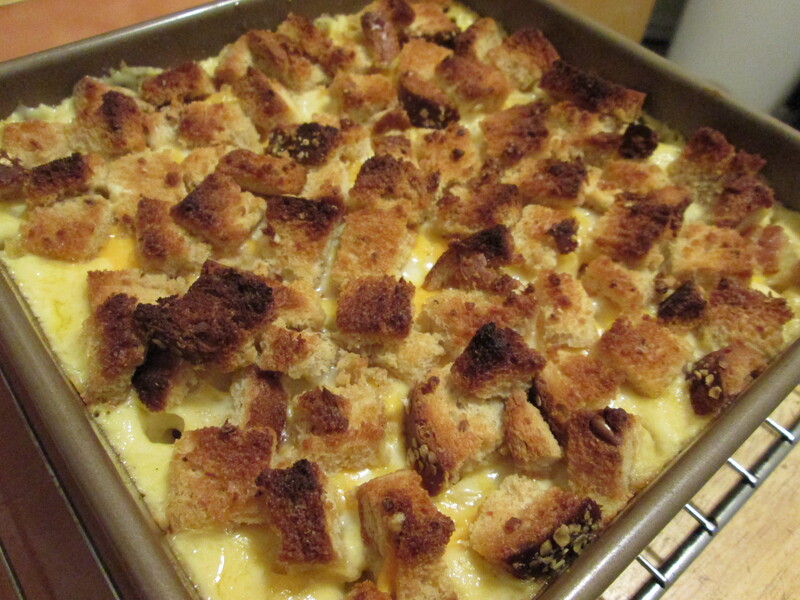 Melt 1 tablespoon of the butter and pour onto bread cubes, toss and set aside. Warm milk in a saucepan over medium heat. In another medium saucepan, melt the remaining 3 tablespoons of butter. When bubbling, add the flour and whisk to prevent lumps; cooking for one minute while stirring. While whisking, slowly pour the warmed milk, a little at a time. Continue cooking, while whisking, until bubbly and thick (8-12 minutes). Remove the pan from heat. Stir in the salt, nutmeg, black pepper, and cayenne. Add 1 1/2 cups of the grated Cheddar and 3/4 cup of the Gruyére (or 1/2 cup of the grated Pecorino). Stir until cheese is melted. Set aside. Cover a large pot of salted water and bring to a boil. Cook macaroni until the outside is cooked but the inside is undercooked (about 2-3 minutes less than the time indicated on the package). Transfer the macaroni to a colander and rinse under cold water. Stir into the cheese sauce. Pour mixture into the prepped dish. Sprinkle the remaining 3/4 cup of Cheddar and 1/4 cup of Gruyére (or 1/8 cup of Pecorino), and then top with the bread cubes. Bake until golden and bubbly, about 30 minutes. Cool for 5 minutes on a wire rack before serving. I used an 8×8 pan, also known as a brownie pan, and it fit perfect. Any 2 quart pan/casserole dish will do for this amount. The original recipe that serves 12 needs a 3 quart pan/dish. Quick trick: use the butter wrappers to butter the pan. I used a yellow sharp Cheddar, but I think any kind will work fine. I originally wanted to use whole wheat elbows but was unable to find some at my supermarket. Any short pasta with a hole should work well. If you’re not feeling wasteful, you can leave the crusts on the bread like I did. No one will notice. To add more flavor to your croutons, consider adding some chopped garlic to the butter while melting. Merry Christmas! I hope everyone is having a lovely holiday, full of great times with family and plenty of gifts, drinks and good food. Per our family traditions, we celebrate Christmas Eve. Back in the D.R., they celebrate Christmas Eve and open presents on January 6th, also known as Epiphany or Three Kings Day. Here in the U.S, we do our gift opening on the 24th instead of the 25th. It’s always been that way since I was a kid, and it’s how it’s always going to be. Of course, as an adult, the amount of gifts dwindle to almost nothing. Unless you’re lucky, then things never really change. Since I’m now an adult (depends on the day and who you ask, to be honest), the most important thing about Christmas Eve is the food. Thanksgiving and Christmas Eve dinners are basically interchangeable in my house. The only thing that is a major change is the main protein. Pernil: the star of the show! The table in full. We did not eat those keys or that cell phone. Pernil: Roasted pork shoulder. I look forward to this amazingness every year. It’s tender and juicy and just absolutely delicious. Don’t be fooled by it’s appearance! 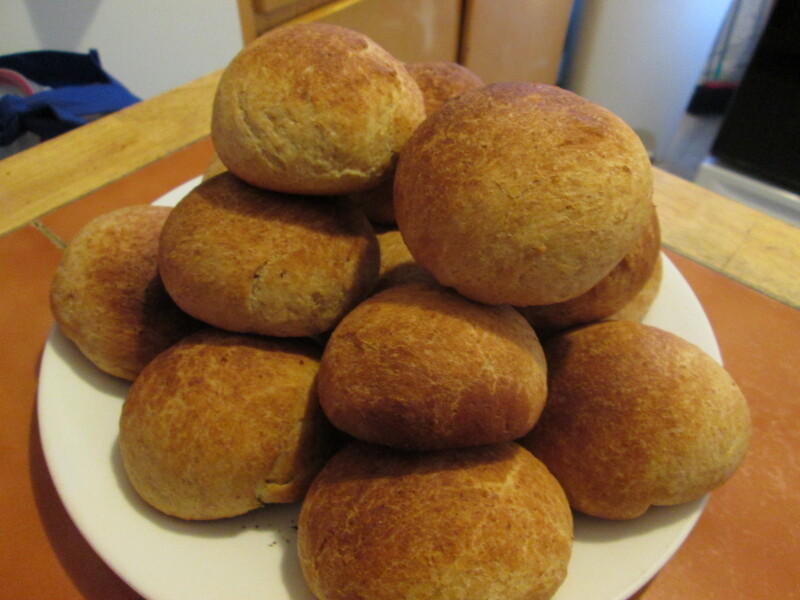 Dinner rolls: these are my standby recipe (again). I did half AP and half whole wheat flour. I also doubled the recipe. Remind me not to do that again by hand. Fruit Salad (not pictured): a giant can of fruit cocktail, mixed with blended sweetened condensed milk and plain Greek yogurt. My Mami also threw in a shot of brandy, for good measure. Random fruit bowl: grapes and apples, given to us by the folks at our local grocery store. They also threw in a bottle of cider. This is another one of those traditions, where they give loyal patrons a bag of this stuff for Christmas and again on New Year’s Eve. Look at this moist slab of awesomeness. Look at that super soaked layer! Our Christmas Eve meal was spectacular, as always. The holidays this year brought a weird feeling but I’m just going to take it as a sign that next year will be better. I hope you guys have a fabulous Christmas, and that you continue to enjoy the rest of the holidays; straight up into next year! Note: for detailed descriptions of the menu, please check out my Thanksgiving post. Ah, pizza. One of my favorite ways to get my carb fix. I haven’t had pizza in forever, so I was definitely due. My sister and I used to regularly indulge in a slice from our local pizzeria, where they’d heat up and fold our slices into a brown paper bag. 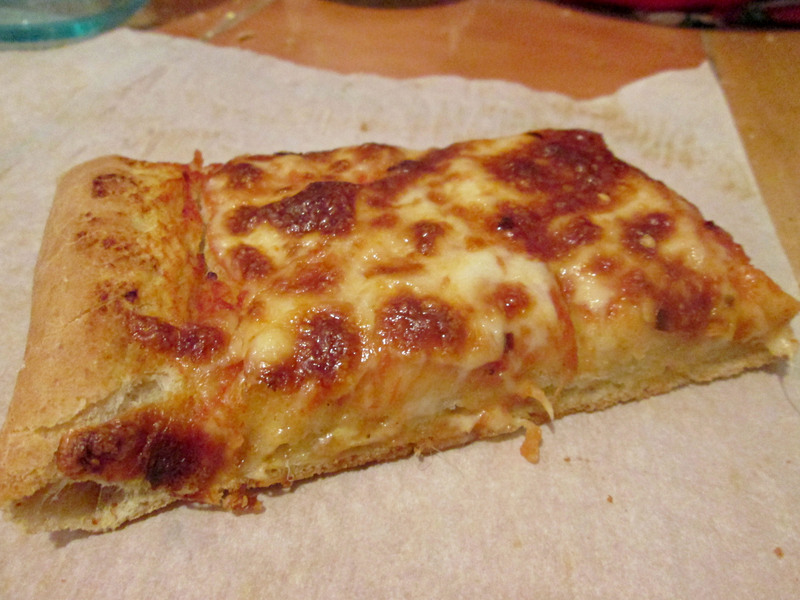 We would pull out the slices and proceed to eat the folded piece of cheesy dough, cold tips first. After deciding to get healthy a few years back, pizza was on my imaginary ‘do not consume’ list. Pizza, along with all fast food, was immediately shunned because of its high calorie count and lack of nutrients. While I am still living a healthier life, it was time to reintroduce my favorite ‘unhealthy’ foods back into my life, but with a huge change. Over the years, I have become one of those people that believes that everything tastes better if it’s homemade. Anything can really be made at home, with a little search and effort. Not only will it taste lightyears better, but you will get some extra satisfaction upon realizing how easy it was and because you did it yourself. As a New Yorker, I have a set of standards for the ‘perfect’ pizza. Every New Yorker compares every single slice of pizza to the one they used to eat as a kid; which undoubtedly becomes their ‘standard’. Now, New York style pizza traditionally has a super thin crust that can be crisp, a thin layer of greasy mozzarella cheese, and is mostly foldable. My friends and I used to open up our slices blot the extra, unnecessary grease before digging in. I knew I wanted something similar to what I used to get from my pizzeria but with a healthier twist. This pizza dough is exactly what it’s name states. The recipe, from King Arthur Flour, is indeed “The Easiest Pizza You’ll Ever Make.” It was a cinch to make, and came out ridiculously delicious. In an effort to make the crust relatively healthy, I switched out about half of the all-purpose flour with whole wheat flour. I also added some vegetables to mine because everything is automatically healthier if it’s loaded with veggies; bonus if there’s vegetables on your vegetable. The result was a super crispy but slightly chewy crust. I rolled it out as thin as I could go, in an effort to imitate the pizza slices of my past. I was pleased at its stability when picked up, and it held on to my multitude of topping pretty well. Now, the crust didn’t fold but that didn’t even matter anymore. And the best part? NO GREASE! 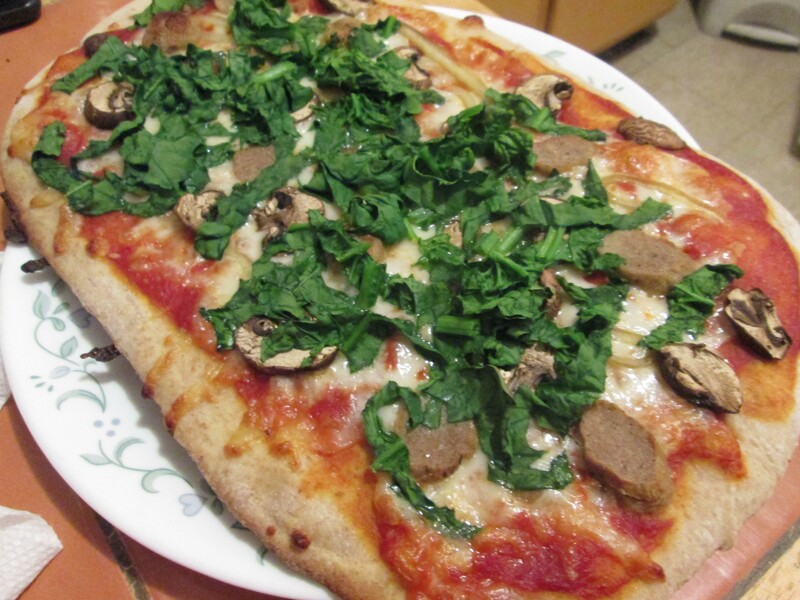 My family and I enjoyed this pizza, so this recipe will definitely be made again. During my pizza crust recipe search,I also came across one of the trendiest ways to eat pizza without the guilt a regular, carby slice might bring. In an effort to have a healthier pizza, and after seeing it everywhere on the internet, it was time for me to try the famous cauliflower crust. I had to try this crust because it was already deemed healthy eats, solely on the fact that it was made with cauliflower. I admit I was a bit skeptical but I love trying new things, and anything that gets more veggies in me is an automatic win. I held out hope for this crust and was pleasantly surprised. It’s not your traditional pizza, like the one above, but it is still a nice substitution; especially if you’re doing the low-carb thing. You kind of have to eat this with a fork and knife though, as it won’t support itself when picked up. Pizza is one of those things that is infinitely adaptable, and these recipes were no different. A pizza night with either of these recipes is sure to be a hit! Dissolve the sugar, yeast, salt and olive oil in the lukewarm water. Let stand for 10 minutes, to proof the yeast. Add the flour, starting with 5 1/2 cups and adding more as necessary to make a soft, smooth dough. Knead the dough with your hands, a mixer, or your bread machine set on the dough cycle, until it’s smooth and elastic, about 7 to 10 minutes. 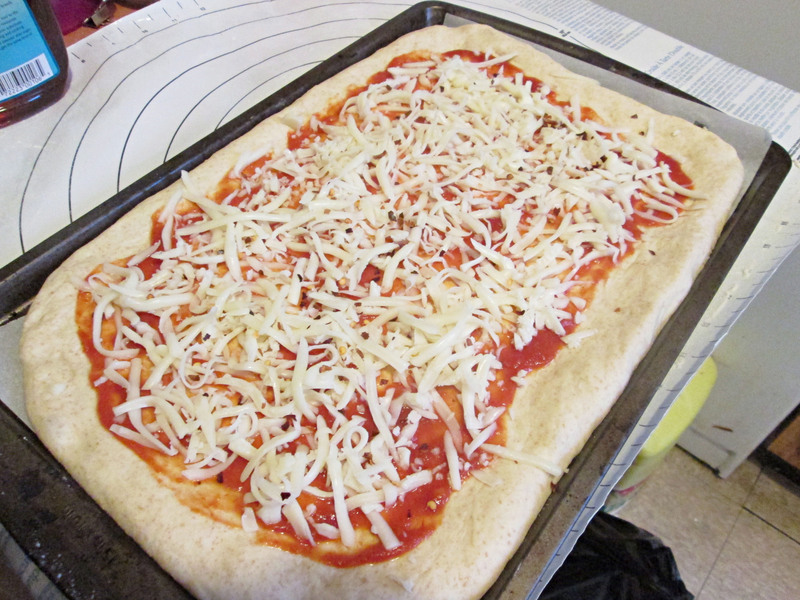 Gently deflate the dough, and divide it into four pieces, for medium-crust pizza; or three pieces, for thicker crusts. Roll each piece, on a floured surface, with a floured rolling pin. 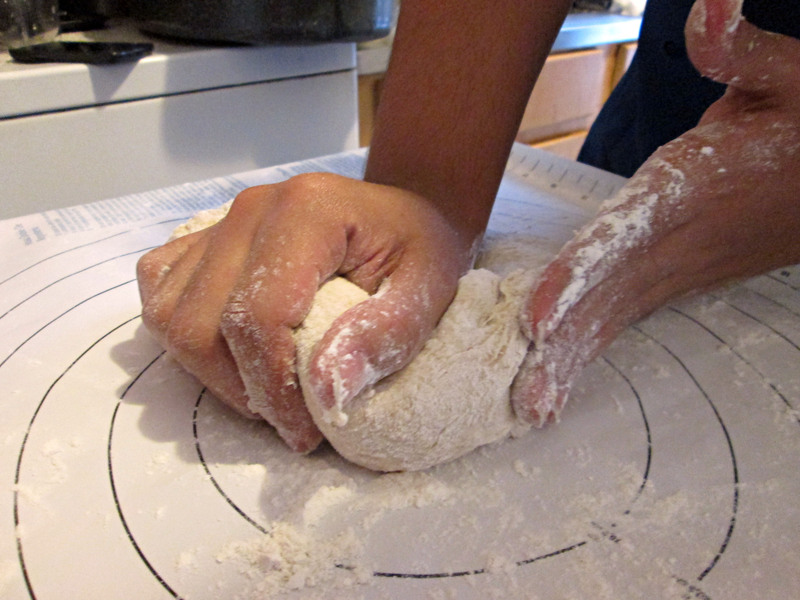 To roll, work from the center to the outside like pie dough. Let the dough rest several times to relax it and make it more cooperative. Turn it over from time to time and roll the reverse side. Place the rounds on pizza pans; on baking sheets; or, if you have a pizza stone in your oven, on parchment. Preheat your oven to 450°F. While it’s heating, get out your toppings, which you’ve prepared ahead. Some possibilities include sliced pepperoni; sautéed mushrooms, onions, or peppers; cooked meats; olives; anchovies; and grated or shredded cheese. Spread pizza or spaghetti sauce lightly over the surface, and add your favorite toppings. Sprinkle the top with grated cheese. Bake the pizzas for 15 to 20 minutes, until they’re golden brown, the toppings are hot and bubbly, and the cheese is melted. Remove the pizzas from the oven. Immediately transfer pizzas to a cooling rack, so the crust won’t get soggy. After about 10 minutes, to allow the toppings to set, slice and serve. Place a pizza stone in the oven, or baking sheet if you don’t have a pizza stone. Preheat oven to 450ºF. On a cutting board, place a large piece of parchment paper. Wash and throughly dry a small head of cauliflower. Cut off the florets—you don’t need much stem, just stick with the florets. Pulse in your food processor for about 30 seconds, until you get powdery snow like cauliflower. You should end up with 2 to 3 cups cauliflower “snow”. Place the cauliflower in a microwave safe bowl, cover, and cook for 4 minutes. Dump cooked cauliflower onto a clean tea towel and allow to cool for a bit before attempting the next step. Once cauliflower is cool enough to handle, wrap it up in the dish towel and wring out the excess water, squeezing out as much as possible. This will ensure you get a chewy pizza like crust instead of a crumbly mess. Dumped the squeezed cauliflower into a bowl. Now add the mozzarella cheese, kosher salt, dried basil (crush up the leaves even more between your fingers before adding), dried oregano (crush up the leaves even more between your fingers before adding), garlic powder (not garlic salt), and a dash of red pepper if you want. Add the egg and mix with your hands. Once mixed together, use your hands to form the dough into a crust on your parchment paper. Pat it down throughly, you want it nice and tightly formed together. Don’t make it too thick or thin either. 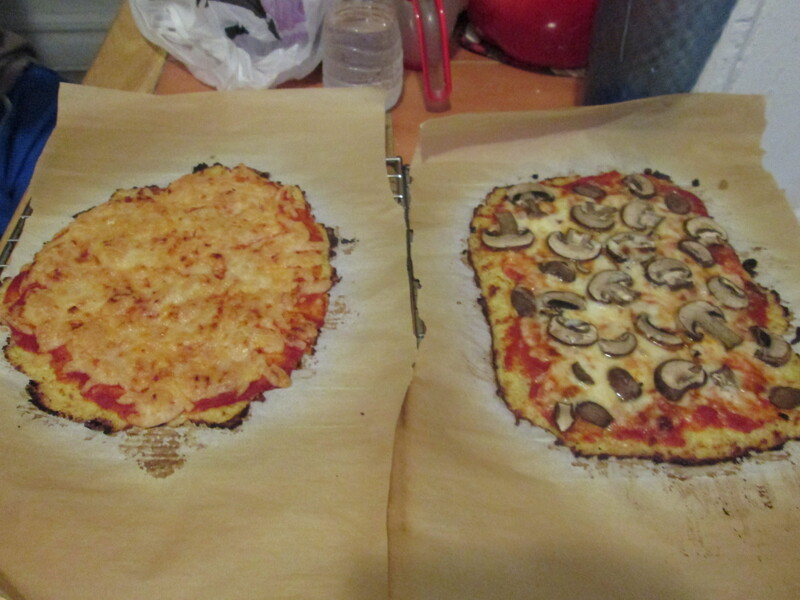 Slide the parchment paper onto your hot pizza stone or baking sheet in the oven. Bake for 8-11 minutes, until it starts to turn golden brown. Remove from oven and add however much sauce, cheese, and toppings you want. Slide the parchment with topped pizza back in the hot oven and cook for another 5 to 7 minutes until the cheese is melted, bubbly, and slightly golden. Allow the pizza to cool for one to two minutes. Use a pizza cutter and a spatula to serve up your delicious grain-free cauliflower crust pizza! I used a combo of whole wheat flour and all-purpose for the King Arthur Flour recipe, but it can also be made with only all-purpose. For the cauliflower pizza, do not fret if you don’t have all the listed ingredients. Use what you have; I promise it will still be equally delicious. To quickly cool down the microwaved cauliflower ‘snow,’ spread out on a plate or baking sheet and place in the freezer for a couple of minutes. I think both of these recipes can be made vegan. For the cauliflower pizza, you can use dairy free cheese (like my sister does) and replace the egg with a flax egg. Let me know if you try this and how it turns out! Take complete creative freedom when topping your pizzas. I added sliced mushrooms, sliced breakfast sausage, thin slices of bell peppers, and fresh, chopped spinach. The possibilities are truly endless! As the title of this post implies, I have renamed this blog. I thought about doing this for a while, and decided to take the plunge. “Toaster Oven Confections” is now “Lucy the Baker.” Why the change? Well, since beginning this blog, I have hardly used my toaster oven for anything. All of the baked recipes on this blog so far have been baked using a regular, stove oven. I don’t want to deceive or mislead you guys, so I changed it. Does this mean that the recipe I post can’t be done in a toaster oven? No! If you do want to experiment and bake in your toaster oven, scale your recipe and temperatures accordingly. This is a rebranding of sorts because I want to post a wider variety of recipes, and try to get myself in the kitchen and on this blog more often. 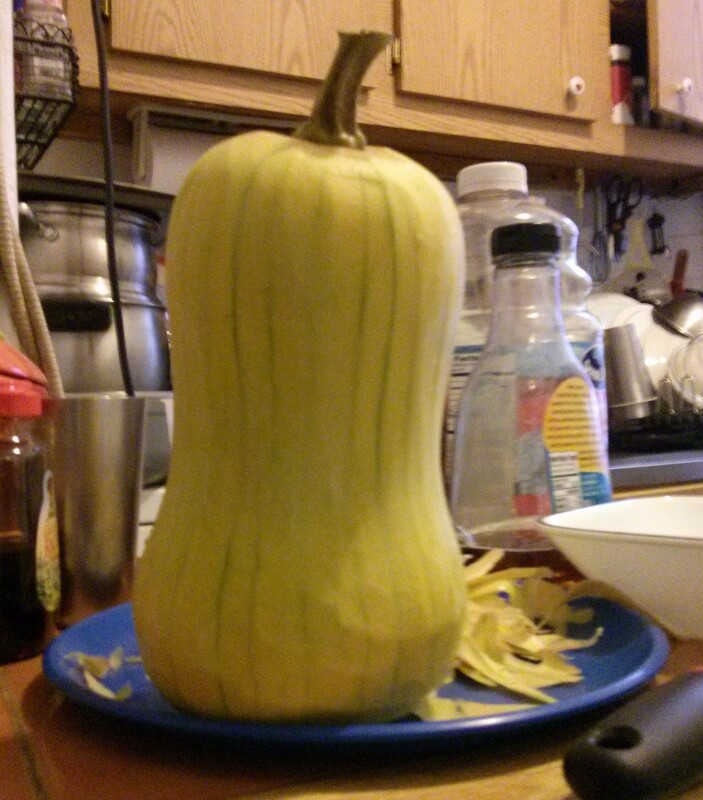 Anyway, let’s talk squash. Butternut squash is one of my favorite vegetables. 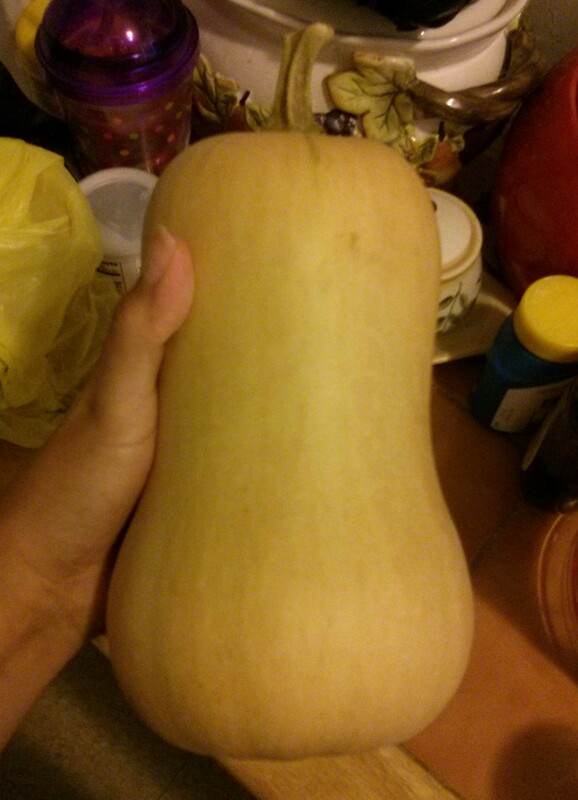 This weirdly shaped winter squash isn’t even a vegetable! The butternut squash is actually a fruit and is known for its bright orange appearance, and its nutty and sweet taste. Its also a great source of vitamin A, vitamin E, vitamin C, and fiber. Butternut squash made its first appearance for the season two weeks ago at my local farmer’s market. I have an affinity for orange vegetables, and was patiently awaiting its arrival. I have bought two in the past two weeks and have been in bliss since. Butternut squash can be cooked any way you’d cook a sweet potato, another one of my fave orange veggies, but best way to tackle one of these beauties is to roast them. 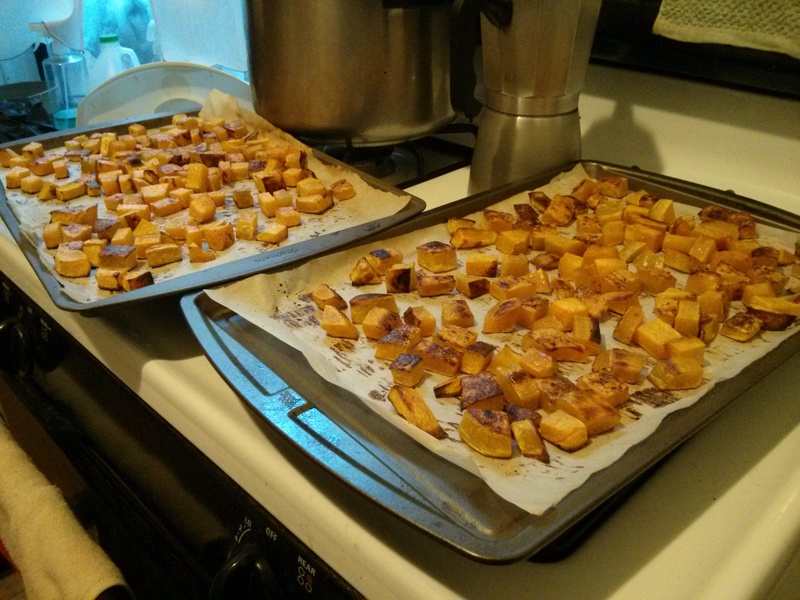 Preheat your oven to 375F and line two baking sheets with parchment paper. To prep a butternut squash, peel the skin off with a vegetable peeler. Now, peeling this baby whole can be a bit of a challenge because its curves can be hard to reach with the peeler. You can actually cut the squash at the bulb, to make peeling easier; just be careful because it is pretty slippery when peeled! Not in the mood to hassle with a veggie peeler? No problem! Roast the squash with the skin on; it is totally edible and softens when roasted. After peeling, grab your cutting board and knife, if you haven’t already, and cut this sucker in half. You can either cut it lengthwise and roast in two halves, or you can separate the bulb from the body and chop both into cubes. Cut off the bulb by cutting the rounded part of the squash. Cut the bulb in half to deseed. The bulb is full of pulp, and seeds that are also edible once roasted; kind of like pumpkin seeds or pepitas. We don’t want the seeds today, so take a spoon and shovel out the pulp and seeds. 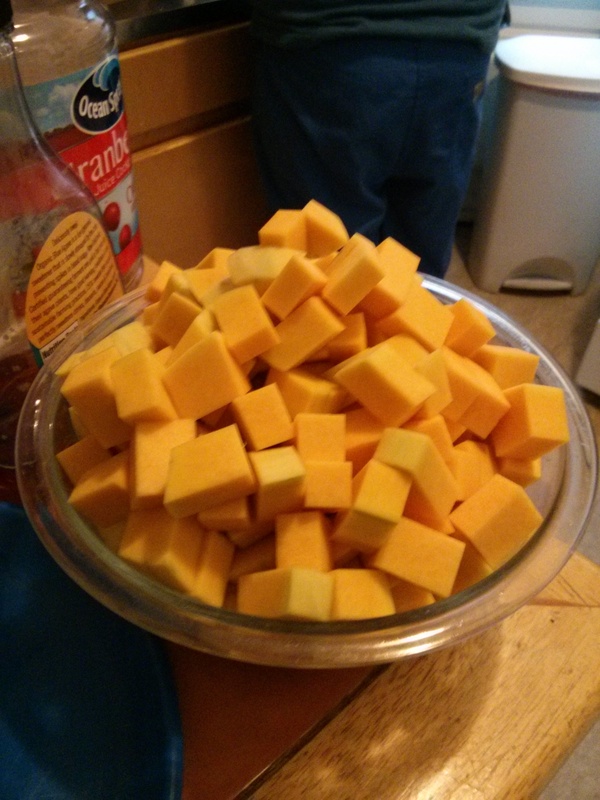 I like to slice my squash into disks, and later into cubes. Place the bulb halves on your cutting board and slice into thick disks. Watch your fingers when chopping! Once done slicing into disks, cut them into cubes. Repeat with the rest of the squash. After you have cubed all your squash, and your fingers are still intact, drizzle the cubes with some olive oil and toss to coat. Distribute your cubes evenly onto the prepped baking sheets. If you’re using the squash in a savory application, liberally season with salt. Roast the cubes for 30-40 minutes, depending on how hot your oven runs, tossing halfway during cooking. The end result is a soft, nutty cube of deliciousness. If you’re planning on eating them with dinner, you can eat as is or puree to put into soups, or even mash them potato style. You can also use roasted butternut squash for sweet applications; just roast, mash/puree, and use them where you would normally use pumpkin or sweet potato. I encourage you to try a butternut squash if you haven’t, and revel in its deliciousness. For those who already feast on this amazing fruit, what are your favorite butternut squash recipes? When my sister and I were younger, my mom used to make us a pancake breakfast every Saturday. We’d wake up and watch cartoons, ready to have our delicious weekly special. And special it was! My mom has never been one to follow recipes and this was no different. She’d buy a giant box of Aunt Jemima pancake mix and and the accompanying bottle of syrup. Every Saturday, she’d empty a large mountain of dry mix into a bowl, add an egg, and eyeball the milk until she deemed fit. She’d preheat a giant skillet; one with little tiny squares on it, and would melt a glob of margarine. In the giant pan, she’d pour the prepped mix. The result was a giant, fluffy pancake; complete with the tiny square imprint from the pan, that was perfect to hold a melting mound of margarine. My sister and I would split this massive pancake, and slather it with margarine and syrup while watching cartoons. I still don’t understand how my mom managed to even flip over such a huge pancake, but I guess that’s part of the motherly superpower allure. As a kid, I used to think everything my mom made was delicious. Actually, that still rings true but as an “adult,” I realized that even though my mom had her own way of making things, it wasn’t always “right.” I am a stickler for following recipes, sometimes to the letter but my mom isn’t. The fact that she didn’t follow the directions on the box doesn’t bother me much because the pancakes came out consistently tasty anyway; it helps that it is box mix. The only issue I have now with our old pancake breakfasts was how she cooked it. Since the pan was so huge and my mom is short on patience; she’d throw all the batter in at once, creating a massive disc of dough. 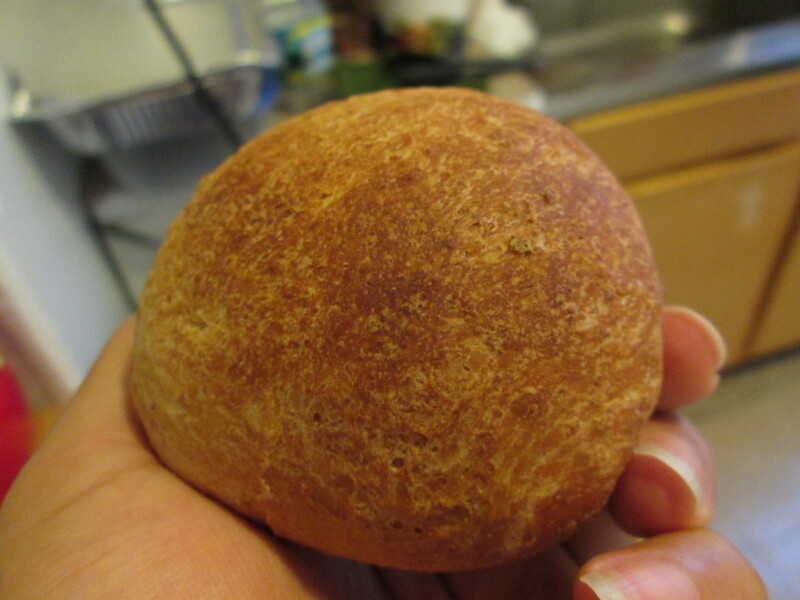 Because of its size, the middle would sometimes come out undercooked and the edges would get slightly burned. The texture of the pancake would go from fluffy to gritty, making us leave more than half of our pieces on the plate. I watched her make it a few times and noticed she would lid it so it would cook completely. I didn’t understand the error of that method until I was older and actually knew what was happening under that lid. The pancake created steam, which dropped the water it created back into the pancake. A super moist pancake is not the end of the world but it did produce a different tasting pancake. It was still tasty, but it was just weird. Now that my sister and I are older, and my mom is no longer home on Saturdays, I have taken our weekly special upon myself. I make pancakes almost every Sunday and they are very different to what my sister and I grew up with. I make mine from scratch, using this ultimately adaptable recipe. Apparently, I got snobby with age because I now frown upon anything pre-mixed; including cake and pancake mix. We may not buy the Aunt Jemima pancake mix anymore, but my family is still a fan of the syrup. We usually have a bottle laying around for this exact purpose. Now, these pancakes are awesome. They may not be my mom’s but I think they’re equally, if not better tasting. I have made this recipe verbatim but here is the modified version I currently use. I’m even positive this recipe could be veganized (something I’m going to have to test). Eating these on the weekends, slathered with margarine and Aunt Jemima syrup, brings back that nostalgia from our Saturday specials. Even though my mom isn’t home on Sundays either, I always make these with her in mind and plan to make them for her the next time she has a free weekend. In a large bowl, whisk together the flour, baking powder,and salt. In a smaller bowl, whisk together the egg, milk, agave, and melted butter. Make a well in the dry ingredients and add the wet ingredients. Mix until the wet and dry ingredients are just incorporated. Heat up your lightly greased griddle or pan over medium-high heat. Scoop the batter onto the griddle, using approximately 1/4 cup for each pancake. 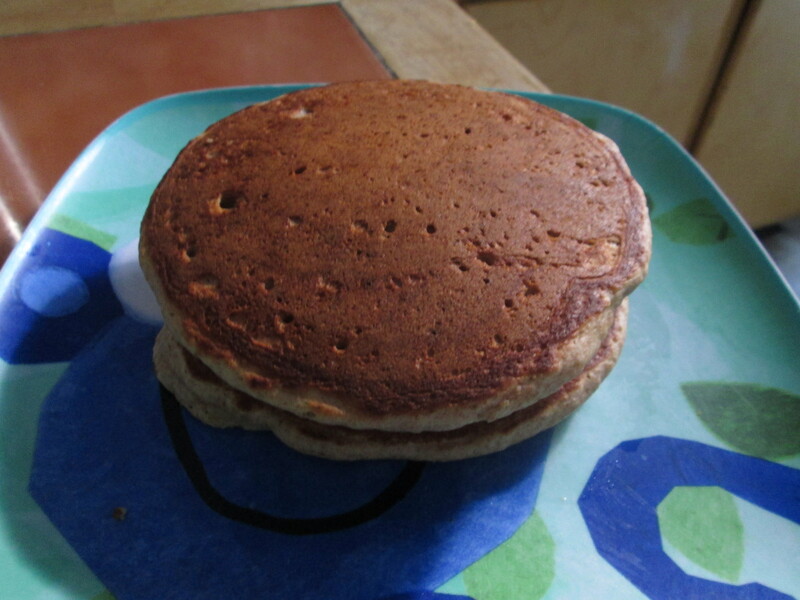 The pancake is ready to flip when bubbles appear near the edges. Brown on both sides and serve hot. If you beat me to the punch and veganize this recipe, please let me know what substitutions you made and how they came out!